Some of the most amazing photographs I have ever seen are taken with cheap plastic cameras. It was not until I discovered lomography that my photography passion really developed. With my lomo cameras I feel relaxed enough to take the kind of photos I want to take. A lot of people want to try out this exciting way of photographing, but at first it seems a little overwhelming to figure out how to start. Here is your guide to get started with lomography. Different cameras will get you different results. Check out the kind of pictures the different cameras take on flickr. Also, read a little about each camera on the lomography website. From my own experience, I really recommend spending out on the Lomo LC-A. It takes amazing photos and feels a little more solid than the other plastic cameras. I can also recommend the Diani Mini for those who would like a small and cheap camera to bring everywhere. Think about what kind of film the camera takes when you chose. I have a Holga that I don't use much, since 120 film is so expensive to develop here in Norway. There are 35mm adaptors for both the Holga and the Diania if you want to have the option to use both. Also consider other cameras. You can find most kind of vintage analog cameras (as well as cheaper lomo cameras) on ebay, as well as other stores. It is not really about the type of camera you use, you can get the same kind of pictures from any vintage point and shoot camera. See if you can find a camera at your local flea or op store! For beginners, I recommend not spending out for expensive film just yet. Be prepared to fail in the beginning! A few rolls where you forgot to take off the lens cap is totally normal. I recommend the regular lomography film. A good ISO to start is 400, it works in most light conditions. If you want regular colored results, go for the color negative. If you want radiant, bright colors, try to cross-process slide film. Buy slide film and ask your lab to use c-41 chemicals. It gives you interesting, saturated results! Also, if you want to go for different kinds of film, make sure you check that your local lab can develop it for a regular price. Some b&w films are more expensive to develop. Try multiple exposures. I always get the best results with multiple exposures. It gives such interesting pictures! If you have a LC-A (or any other camera with iso settings) set your ISO setting to twice the number of your film (eg. if you use ISO 400 film, set it to ISO 800). This will give you the best results, to ensure your photo doesn't end up too bright. Try the splitzer. You can buy one from Lomo or make your own with some cardboard. The splitzer will save a part of your photo for the second exposure. This will give you the opportunity to divide your photos in parts. Find a lab that understands what you are looking for in your pictures. If you want your photos to be as raw as possible, you should ask your lab to don't edit anything. Most labs automatically edit contrast and saturation, and this will often take away some of the unique feel you get in your lomographs. In my experience, you can save a lot on getting your photos straight to a cd. If you are using them online only, this is a great way of saving. Also, you could consider investing in a negative scanner. This way you can get your lab to develop and then you can scan yourself. This will save you some money in the long run. For black & white, I recommend trying to develop them yourself in a darkroom. It is so much fun! I think everyone should try this at least once! If the task of setting up your own darkroom seem a little overwhelming, ask your local photo club if they have a darkroom. They might also host introductory classes. Share your photos! You can of course upload your photos to your blog or share them on Flickr. But did you know that Lomography also has a sharing facility? Here you can share your photos with dedicated lomographers. You could also consider making your own portfolio on carbonmade and sites like deviantart. I'm also a big fan of sharing photography in other ways than online. Make your own photo album, printed photo book or hang them on your wall. 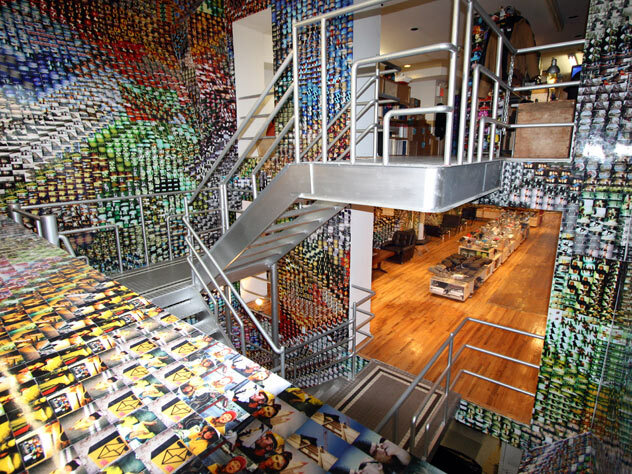 What about creating a photo wall like they have in the lomography stores? I also love the idea of sharing photos with friends and family by sending them a photo in the mail. The point is basically; don't let your photos end up in a drawer og in the wast corners of your hard drive. A last tip: Never forget to take a back-up if you are storing your photos digitally. I hope this guide was helpful if you want to start having fun with lomography! Remember; it doesn't have to be costly, all you need is a simple toy camera and some film. If you are interested, but not convinced, you can find more information on lomography here: Lomography Magazine, Flickr Lomography Group, A guide to Lomography and The Complete Beginners Guide to Lomography. If you liked this article, why don't you subscribe to my feed and help me reach my goal? Thank you! Did you find this helpful? Do you have any more tips? Please share in the comments!